While the movement toward a fee-for-value model in healthcare is old news, exciting new developments in chronic care management (CCM) are beginning to take shape wherein healthcare providers can get reimbursed in more traditional ways for performing tasks associated with improved outcomes and overall, long-term cost reductions. Center for Medicare & Medicaid (CMS) established CPT® code 99490 in 2015 to pay for up to 20 minutes each month to manage the care for patients with multiple chronic conditions. 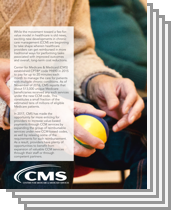 As of November of 2016, CMS reports that about 513,000 unique Medicare beneficiaries received any such services under the new CCM code. This constitutes a small fraction of the estimated tens of millions of eligible Medicare patients. In 2017, CMS has made the opportunity far more enticing for providers to increase the reimbursement of CCM services by expanding the group of reimbursable services under new CCM-based codes, as well by relaxing some of the requirements for such reimbursement. As a result, providers have plenty of opportunities to benefit from expansion of valuable CCM services through their staff or through competent partners. Thank you for your interest in SymphonyCare! Please contact us with any questions.